Other questions lurk, too…since the Chantix turkey represents the slow turkey approach to smoking cessation, might we someday expect to see his cousin, cold turkey? That bird might be imagined as being cold to the point of chattering, and to have really jittery nerves. As we view the Chantix turkey hiking in the woods, we’re sorry that he’s mute. Perhaps in the future he could be given a voice, even singing the Happy Wanderer song as he hikes. With just a little refinement, this turkey could really take off. 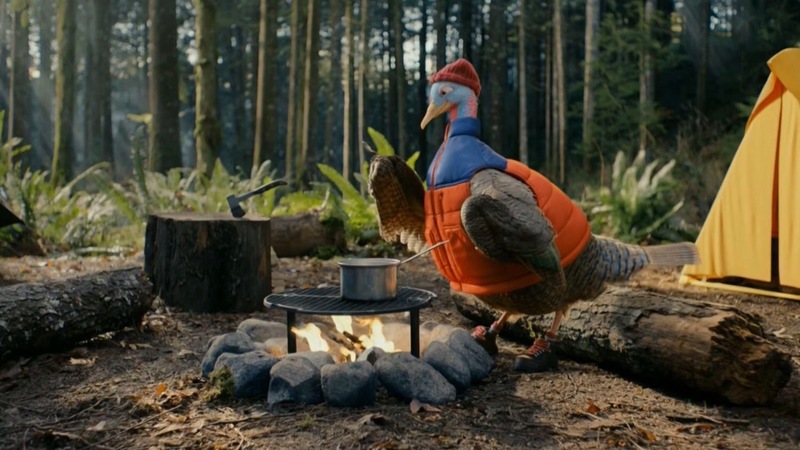 He even cooks over a campfire, and I’d toast marshmallows with him..we’re all forest friends here! 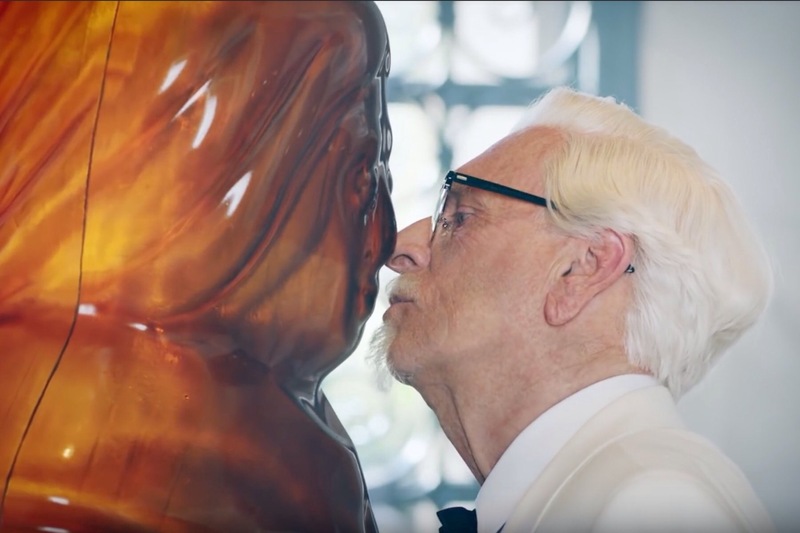 I had thought that last November’s KFC commercial featuring a Colonel Sanders impersonator dancing with a human-sized bottle of Mrs. Butterworth syrup was a once-and-done thing, but in a companion piece commercial airing currently, the Colonel is back, complete with a misty, bedroom-eyes type expression as he meets Mrs. Butterworth in a marble hallway while a Celine Dion ballad plays. I know that they say “the South shall rise again,” but this is ridiculous! Mrs. Butterworth appears to make the first move as the impossible couple stare into each other’s faces and the Colonel caresses her molded plastic cheek, probably thinking of all the syrupy goodness contained within…then the couple lean towards one another as a preliminary to a kiss which thankfully, we don’t get to see! Johnsonville Sausage incorporates employee input in all phases of their operation, including this commercial which was conceived and is starred in by an actual long-term company employee. 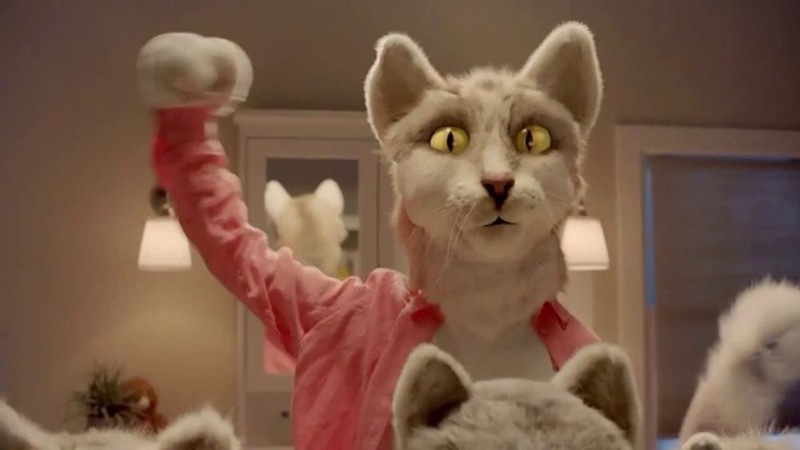 Since without the animal presence this commercial would consist of ho-hum talk about sausage, we’ll listen to anything if an animal presents it! Geico’s “Lobster Hot Tub Party”.. I have often walked past the lobster tank in my local supermarket, pitying the poor doomed creatures within and wishing that I could set them free, like some kind of crustacean messiah. In a recent Geico commercial, I can imagine one such liberated lobster enjoying his freedom, sitting in the corner of a hot tub, his claws spread wide as he enjoys the tub jets. There are also two newlywed humans in the far corner of the tub with him. After nine episodes, The Masked Singer concluded its first season on February 27th, that episode clocking in at an inflated two hours. The first hour was a recap of the contestants previously unmasked and eliminated, leading down to the three finalists of Monster, Bee, and Peacock. My enthusiasm for the series dwindled when Rabbit (Joey Fatone) was eliminated in the semi-finals, which I think was caused by his later selection of materials, none of which generated the excitement of his first performance of “Livin’ La Vida Loca.” No one really wanted to hear Rabbit sing “My Girl” or perform a country number, although he reportedly remained in character even when on breaks during rehearsals, and I felt that he and Peacock best incorporated dance and stage presence into their performances. Perhaps these guys could continue to perform as their costumed characters; I’d go to a psychotic Rabbit concert! I was rather surprised that Bee (Gladys Knight) came in third, with the Peacock (Donny Osmond) coming in second…this guy is an underrated performer! Monster (T-Pain) won the top honors with his soulful croonings, and seemed to be a sentimental favorite despite being nearly eliminated in an early round. One of a series, “Little Lungs in a Great Big World: Snowboard,” brings us the little lungs in question being asked by other bigger, presumably healthier lungs if they’d like to go snowboarding with the group. The little lungs respond in the affirmative, but because they had smoked as a teenager are smaller in size,and subsequently unable to draw in enough air and keep up. They wind up wiping out and getting skewered by the antlers of a moose, one eye hanging disconcertingly out of its socket.